As it feels like I haven't created an eBay post in what seems like forever I thought I would put together a miscellaneous edit with an under £5 budget to get back into the swing of things. I personally love discovering eBay items, generally from power sellers or stores, that offer a good saving on their retail value. So this edit combines bargain find as always, along with a few items that offer some great savings - I hope you love them! First up, a crazy deal of five stunning Maybelline Color Show Nail Polishes! Retailing at £3.99 each these are normally budget nail polishes to begin with but £4.99 for all five nail polishes (plus a free Maybelline lip balm) make this a bargain I couldn't refuse! While a few of the glitter shades are perfect for over a bright base colour this summer, the black, orange and magenta nail polishes are making me think of Autumn, which I not so secretly cannot wait for. I've purchased from this seller in the past and highly recommend snapping up this bargain! Another great saving is this set of three Invisibobble packs which normally retail for £3.95 each, so 9 individual invisibobbles for £4.99 is an amazing price! I personally love this type of hair bobble, in fact, it's the only thing I use to tie my hair up these days, as they don't pull on the hair, snap or get hair tangled around them. They are also perfect for beach holidays and swimming as they are waterproof and don't get stuck in your hair! Again, a highly recommended UK seller that I've used multiple times. If you are a blogger or just love pretty things then this bargain set of three gold trinket trays may interest you. With the largest trinket dish measuring 21.5cm (L) x 14cm (W) these are a great size for both displaying and using on a desk or simply as pretty blog props. I'm very tempted to pick up a few, one for myself and a few as gifts due to the amazing price point! Next up, a really clever and fun way to store both earrings and necklaces! 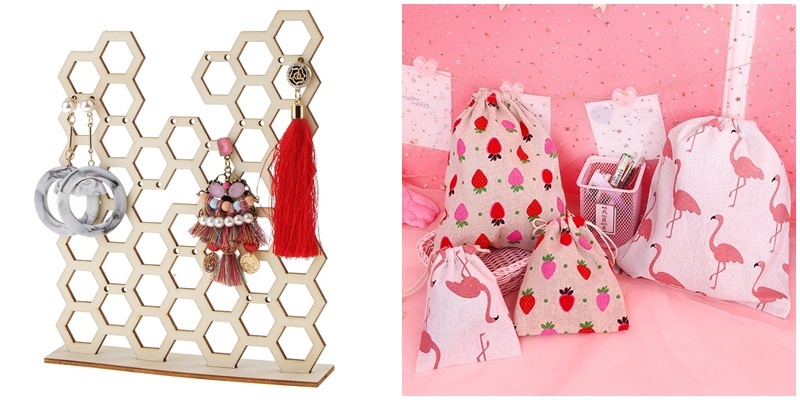 This simple jewellery holder in a lovely honeycomb design can be left natural or sprayed or painted as it's a natural wood finish. But personally, I would be tempted to spray is gold even though the natural finish is also nice. I really do love the look of this earring holder a lot. Available in 4 patterns and in 3 different sizes all at 99p each I had to include these handy but cute drawstring bags. Ideal for separating and organising when packaging or for toiletries I feel having a few of these would always come in handy. This is exactly why eBay is dangerous! If stationery is your thing then you may just want to pick up one of these amazing suspended glitter pens. Above are just two of the three available designs, which include a rose gold glitter pen and a gold pen with multicoloured glitter (I picked this one up last year and I love it!) which for the price are really high quality. An eBay find I couldn't resist from including in this mish match round-up! Another purchased item that I absolutely adore and highly recommend if you have ever lusted after the £165 Alex Monroe Bumblebee necklace. While this, of course, isn't gold plated it is surprisingly good quality with a nice dainty chain and not being yellow gold in colour. This is one of my favourite jewellery pieces that I still can't get over how cheap it was! Staying with purchased items I had to include the cutest pair of scissors that are not only handy but look so nice on a desk or as a blog prop. These also would work well as a little gift I think! Lastly, I wanted to include this affordable custom art print as it's just such good value for money! Perfect as a gift or just as a custom piece of wall art for yourself to frame. The seller also has an amazing array of wall art starting at only £3.45 here. Let me know your favourite picks in the comments below!